The government asserted that it will deliberate on the issue in Assembly during the budget session on February 21. 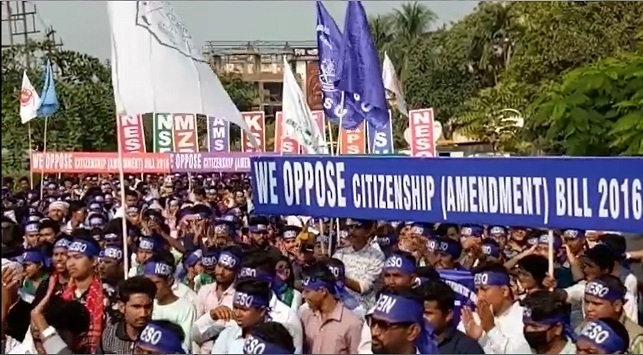 Even as more organisations extended support to the bandh called on Monday against the Citizenship (Amendment) Bill, the Nagaland government on Sunday appealed to the Nagaland Gaon Burhas’ Federation (NGBF), all civil society organisations and NGOs to reconsider their decision. The government asked the organisations to oppose the Citizenship (Amendment) Bill unitedly in a democratic manner. “We are united and very clear in our resolve to protect the interests of the state,” an appeal issued by chief secretary Temjen Toy said. The government asserted that it will deliberate on the issue in Assembly during the budget session on February 21 and propose adoption of a resolution as decided in the consultative meeting on January 31. The appeal referred to the resolutions adopted at the January 31 consultative meeting in Chumukedima. The government pointed out that the consultative meeting on the bill convened by the Nagaland government with civil societies, tribal organisations, political parties, NGOs and student organisations at Chumukedima resolved to oppose the bill and reject its implementation in Nagaland. The meeting made it clear that Nagaland is a “political state” formed out of the 16-Point Agreement and accordingly Article 371 (A) of the Constitution protects and safeguards the rights and privileges of the citizens of the state, as “no act of Parliament shall apply in the state unless the Nagaland Legislative Assembly by a resolution so decides”. The meeting stated that all Naga organisations should have unanimity in supporting this stand in the greater interest of protecting the rights and privileges of the people as enshrined in the Constitution. The government in its appeal also said it is the time for examinations for students who may need to travel for classes, examinations. A bandh at this time will adversely impact them, it stated. The government said it shared the concern and apprehension of all Naga civil society organisations over the Citizenship (Amendment) Bill. “We stand with the people on this issue,” the government affirmed. It regretted that the invitation to Nagaland GBs’ Federation and the Central Nagaland Tribes Council to the consultative meeting on January 31 was missed out initially but was rectified later. The Central Nagaland Tribes Council, Naga Council Dimapur, Opposition Naga People’s Front, Eastern Nagaland Peoples’ Organisation, Chakhesang Public Organisation and Mokokchung District GBs Association on Sunday extended support to the strike and urged all to stand united against the bill.